Flarbles are the smallest flying toy in the world. Made 100% in the USA! These tiny propellers model after a ‘puddle jumper’ that the founders Dad would carve out of wood. He was curious to see how small he could make them. Down to the size of a fingernail and still able to fly, Dad’s imagination started going on mass producing these gems for kids all over the world. Last year they debuted at the International Toy Fair in NYC with these colorful flying toys. A simple toy, only limited by your imagination. Flarbles are used in therapy to help people regain their fine motor skills. A portion of the proceeds goes to benefit Spinal Muscular Atrophy , you can read Tori’s Story to find out more about this. "Hold the Flarble® with the propeller up and the shaft down in your right hand, between your middle finger and your thumb (see illustration) give it a firm grip and then with a quick snapping motion-much like snapping your fingers-spin the Flarble® counterclockwise. 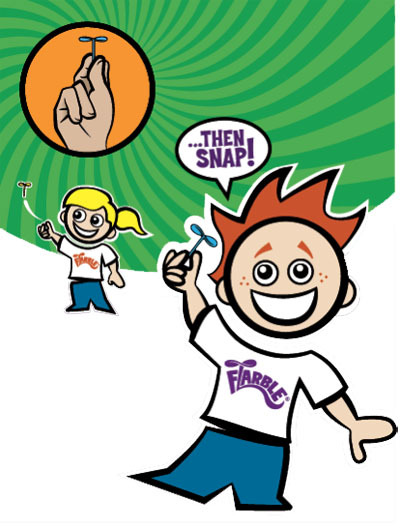 If you are left handed you can fly it the same way with one trick-hold the Flarble® upside down and snap! After you have mastered vertical flight try holding the Flarble® more horizontally. See how far you can fly it, go for distance and accuracy. With a little practice you should be able to fly your Flarble® 20 feet or more!" Fun in a small package, you can carry Flarbles in your purse or pocket to hand to kids you see, to entertain yourself, or give your own kids a challenge to think of a game to play with them. I love how they are made in USA! And I love how they give back! You can buy them online or look for a store near you that sells them. These remind me of seed pods that you can twirl that come off of trees in our area. what fun...my 3 year old grandson would have fun! love they are made in the usa! My kids would love these! They are both in love w/anything that fly's...Glad to see some toys that are Made in the USA instead of China! so teeney..this is fun in an of itself but also as a physics/engineering lesson. good times. Cool. We love spinning tops -- looks like an air version.